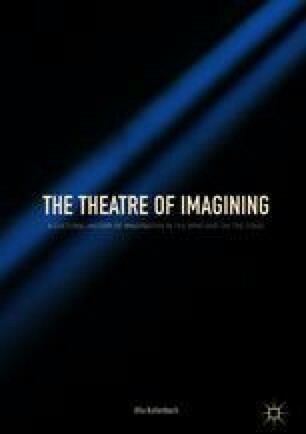 This chapter presents the concept of imagination and its relevance for drama analysis. Kallenbach discusses how an analytical perspective for studying imagination in the drama text may be set up—positioned in the intersection between text and performance and taking the perspective of the active, implied spectator. Kallenbach considers the variety of understandings of imagination and argues that the cognitive processes of imagination must be complemented by a historical contextualization. Imagination must further be studied in interplay with physicalization; that is, the sensory, spatial scenic elements. She then develops an analytical framework that facilitates examination of how the spectator is engaged, asking how the presentation of the performance triggers the activation of the spectator’s imagination to perform an act of transformation into re-presentation.